Thriving Ivory returned to Juanita’s Cantina during the hottest summer in recorded history, and on this particularly sultry August night, the air conditioner wasn’t working properly for the full house of musical fans, not literal fans. Although the air temperature was less than ideal, it did not seem to have a diminishing effect on the audience as the night wore on. First up to entertain was the local Little Rock sextet, Free Micah. 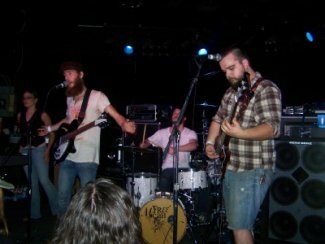 This popular Arkansan folk rock band has been making waves and building a solid fan base the last few years. One of the key elements of their sound is the unique juxtaposition of the soft and subdued sounds of the cello, keys, and female vocals with the harder, more heightened sounds of the dual electric guitars and the male lead vocals. Reminiscent of a heavier Coldplay or perhaps a more melodic Modest Mouse, these guys and one girl had a seven-song set list, which started off with “Love Gone Cold,” an ode to a failed relationship, followed by “Get Over You,” a tragically optimistic break-up song and ended their time on the stage with a song entitled “Little Rock,” inspired by, you guessed it, the band’s hometown. Although the lead singer expressed appreciation for Ryan Star, his gratitude obviously didn’t spill over onto Thriving Ivory, which I found to be in poor taste. The talented Free Micah may eventually branch out of Arkansas if they can properly recognize the opportunities given to them. Ryan Star and his band was next up and I gotta tell ya, he impressed me. It was my second time seeing him in concert and this performance was, by far, better than the first. He seemed much more comfortable, unforced, and more in his element this go round. The sensual rocker is a former contestant on CBS’s 2006 season of “Rock Star: Supernova,” and from what I can see, although not the winner, Star is the most commercially successful act thus far. His well-received, long awaited album, 11:59, was released earlier this month to anxious fans and is climbing up the pop charts. 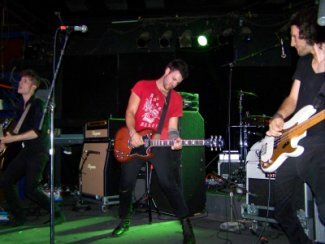 His young, four-person band was dressed in all black in contrast with Ryan’s faithful red Angel Maker T-shirt. He started his set with “Brand New Day,” an inspirational song about being on the precipice of change and being in the here and now moment. This beat-driven song has an escalating tempo that provides a different, more experimental sound from the others on the album. Many references to time come together to make up the theme of the album. Yours truly happened to be in the front row and being prepared for just such an occasion where the air conditioner stops working during the hottest month in the hottest year, I had with me a trusty, hand-held fan that grabbed Ryan’s attention half-way through his performance. He came over for a cool down, which I gladly obliged. 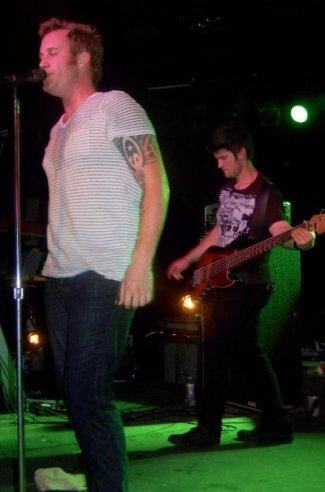 Right before he played his latest single “Breathe,” (which is getting increasing air time on the radio and as a video on VH1 featuring “real people, looking for real jobs”) a song about reassurance amid uncertainty, the lights were dimmed and Ryan tuned his acoustic guitar while his band left the stage. Ryan’s sincere passion and heart came across loud and clear, and although he may not be sky-rocketing into orbit right, now his star is glowing brighter and brighter with each passing year. Ryan Star was backed by his talented band consisting of Elias Logothetis on drums, Arthur Fleishmann on bass guitar, Daniel Tirer on electric guitar and Dallin Applebaum on keys and background vocals. Thriving Ivory was introduced by a local radio personality, Jason Cage, from ALICE 107.7, before coming out to greet their fans. This group of Californians have been touring extensively for the past several years and each time they visit Arkansas their audience grows. Charismatic frontman Clayton Stroope always expresses the band’s gratitude and affection, definitely an attractive quality and, no doubt, this makes them all the more endearing to their fans. Although there seems to of been a shake-up in the line-up this year, the guys sounded and looked great with the addition of Charlie Reid, hired bassist, and John Varn, hired keyboardist. Noticeably absent was one of the group’s founding members, songwriter, and pianist Scott Jason. Like Ryan Star, Thriving Ivory seemed more comfortable than I’d seen them at past shows, with Stroope interacting more with the crowd. He asked if the weather was always this hot or did they (Thriving Ivory) bring it with them. That prompted an “I love you” from a young female fan, to which Clayton responded in kind. Then a more masculine voice followed suit with Clayton more reluctant to reciprocate his affection, which the onlookers found entertaining. Also, like Star, he too sought to be cooled by my fan — lesson here, kids: hot musicians love for their fans to carry fans. Several times we were reminded by Stroope that their sophomore album, Through Yourself and Back Again, is due out September 14. At one point, a “Yee Haw!” was sounded and Stroope quizzically acknowledged it then went down a short list of southern slang they’ve been hearing while in the lower states. Before performing their new single, “Where We Belong,” a song that’s been generating a buzz on VH1 and has also been on regular rotation on the radio waves this summer, Stroope expressed the band’s excitement for it’s growing success and potential. They slowed the evening down with their hit ballad “Hey Lady” by using only an acoustic guitar and keys, but then brought it right back up with their funky, fresh take on Stevie Wonder’s “Superstition,” a song we were told they don’t play often, which is unfortunate because it is a fun dance number. Lastly, they gave us their most popular song to date, “Angels on The Moon,” inspired by the events of September 11, 2001 and by brotherly love, and the audience returned that love as they loudly sang along. The charming Stroope, with his signature warble falsetto, along with the adroit Drew Cribley with background vocals, electric and acoustic guitar and the skillful Paul Niedermier on drums, just keep cranking out dedicated performances and powerful rock ballads. Thriving Ivory have become known for their emotionally charged songs with orchestral build-ups that appeal to the masses, both young and old. I encourage everyone to see Thriving Ivory in concert and buy their new CD and you, too, may find new appreciation for them by going Through Yourself and Back Again. 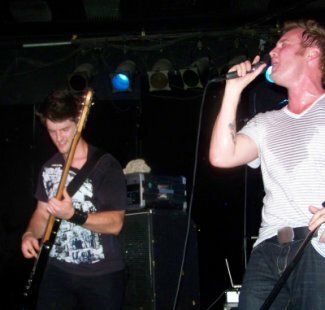 Juanita's was miserably hot that night and I don't think the fans gave the performers the respect they deserved. I was embarrassed! Come on…. Ryan Star is awesome and no one seemed to really get excited about his performance.